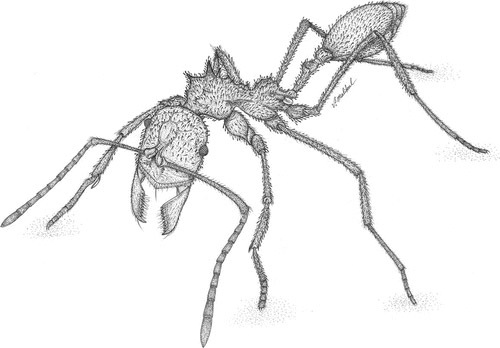 Tetraponera merita Ward 2009 is one of many aculeate species described in the pages of a new festschrift honoring Roy Snelling. I can’t link to it, unfortunately, as the festschrift is printed the latest issue of the paper-only Journal of Hymenoptera Research. All the same, if you can get your hands on a copy the effort is worth it, especially for a touching biography penned by Jack Longino and Roy’s son, Gordon Snelling. The festschrift also holds a couple dozen articles spanning the ecology, chemistry, evolution, and systematics across a broad sampling of aculeate hymenoptera. Rather appropriate considering the scope of Snelling’s career. source: Ward, P.S. 2009. The Ant Genus Tetraponera in the Afrotropical Region: the T. grandidieri group (Hymenoptera:Formicidae). J. Hym. Res. 18:285-304. Doesn’t “bigote” mean “moustache” in Spanish? The inimitable Jack Longino published a taxonomic paper today on the Central American Pheidole, including descriptions of some 23 new species. Among these is the marvelously moustached P. bigote. The function of the fantastic facial hair remains unknown. source: Longino, J. T. 2009. Additions to the taxonomy of New World Pheidole (Hymenoptera: Formicidae). Zootaxa 2181: 1-90. The ant genus Forelius – named for the eminent Swiss myrmecologist Auguste Forel– is known for its abundance in hot, dry climates in both North and South America. This affinity for deserts has given the genus a markedly disjunct distribution, abundant in subtropical South America and in the warmer regions of North and Central America but absent in the more humid intervening climes. Or so we’d assumed. Last week Colombian myrmecologists Roberto Guerrero & Fernando Fernández filled the gap with a newly-discovered species of Forelius. Their collections matched several undescribed specimens from Jack Longino’s Costa Rican surveys, and is the first Forelius known from Colombia. source: Guerrero & Fernández 2008. A new species of the ant genus Forelius (Formicidae: Dolichoderinae) from Colombia. Zootaxa 1958: 51-60. In today’s Zootaxa, Katsuyuki Eguchi has a taxonomic revision of the northern Vietnamese Pheidole, recognizing six new ant species for a genus that is already the world’s most diverse. The revision also contains several nomeclatural changes and a key to the thirty or so species occurring in the region. As in most tropical taxonomy this research has a comedic/tragic effect of adding several more species, about which nothing is known, to a catalog already overflowing with equally mysterious species. We don’t know what they eat, how long they live, how large their colonies are, or when or how they mate. Many will meet extinction without ever receiving more than a cursory taxonomic registration. Perhaps Pheidole rugithorax has something to teach us; the odds that anyone will get around to learning it are slim indeed. source: Eguchi, K. 2008. A revision of northern Vietnamese species of the ant genus Pheidole (Insecta: Hymenoptera: Formicidae: Myrmicinae). Zootaxa 1902: 1-118. The new world tropics continue to be a rich source of species discovery. Today’s issue of Zootaxa contains a monograph by Rodrigo Feitosa and Beto Brandão revising the ant genus Lachnomyrmex, a small yet delightfully wrinkled group of soil-dwelling ants. Of the 16 species recognized in the new paper, ten were previously unknown. For the mathematically-challenged, that’s more than half. Lachnomyrmex amazonicus, pictured above, is one of the new species. It has been recorded from lowland humid forests in the states of Amazonas, Para, and Mato Grosso. source: Feitosa & Brandão 2008. A taxonomic revision of the Neotropical myrmicine ant genus Lachnomyrmex Wheeler (Hymenoptera: Formicidae). Zootaxa 1890 1-49.